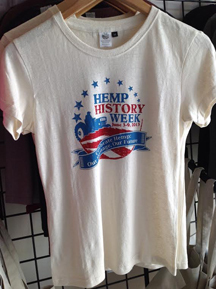 Help support Hemp History Week and the Hemp Industry Association with this hemp t-shirt featuring the 2013 Hemp History Week logo on the front and “Let U.S Farmers Grow Hemp” on the back. This commemorative Tee marks the first time in 60 years Industrial Hemp has been planted in the United States. A portion of the proceeds will go towards Hemp History Week and to help support the HIA. Hurry while supplies last! Available in Men’s and Women’s sizes, and is made from 55% hemp and 45% organic cotton. Hemp is a naturally organic, chemical-free and environmentally friendly fiber. Hemp can be grown using little to no pesticides, whereas cotton consumes about 16-25% of the worlds insecticides – more than any other single crop. Hemp crops also do not require herbicides, mainly because hemp grows so dense it blocks out light from reaching the ground not allowing any other vegetation to grow. Hemp is a rotational crop – the rotation crop is usually vegetables. Hemp crops also do not deplete the soil of natural and beneficial nutrients and minerals. Hemp is a high yield fiber crop which is fast growing, maturing in usually 90-120 days. Hemp has a high absorbency rate because of the fibers unique molecular structure allowing your shirt to wick away moisture and breath better. Hemp is anti-microbial which means the fiber is naturally resistant to mold and mildew due to the small air pockets within the fiber which allow more air to pass through, thus not allowing bacteria and mold to grow.